We got an early start today – a bit too early, actually, because we ended up missing out a bit. We travelled to the northern end of Notting Hill to see the famous market along Portobello Road, but there were very few stands set up by the time we got there at 9, and none of the cute shops were open either. We wound our way down to the main area of Notting Hill, seeing some very cool architecture along the way. Then the Kensington High Street, followed by a quick peak at Kensington Palace (didn’t see the Princess Di memorial, though). We finally made it into Westminster Abby, which is where I saw possibly the coolest thing I’ve seen on this trip – the Tomb of Queen Elizabeth I. Besides the typical gate around it, I was right next it. Crazy. I mean, I’m still having a time grasping the reality that her remains are in the tomb, and I was right there. Nutty. Sir Isaac Newton is also buried there. It’s an amazing place. Today was all about the wandering around with not a lot of direction. We walked, and walked some more, stopping to buy snacks along the way to refuel. I also picked up “‘Tis” the second Frank McCourt memoir (I bought “Angela’s Ashes” at the airport and finished it yesterday). I recommend at least the first one – it is really vivid and well-told. Anyway, we walked down and discovered a little hidden area that was quite beautiful, sat in the sun (yes, sun!) along the Victoria Embankment of the Thames, and then travelled up to St. Pauls where we rested in the sun some more. A French cafe called our name, so we had to pop in for some extravagant sweets. Then more walking to burn it off – up to the Museum of London, where we saw a pretty interesting exhibit on the great fire of 1666. I’ve been noticing some great things Londoners have done that we should take note of in the states. I’ve already mentioned the marking for vegetarian-friendly foods. Their tube also tells you when the next train will arrive (as well as the next two! ), and they have free papers for commuters in the morning and in the evening. They also don’t seem to honk nearly as much as New York drivers. And at the zebra (prounced like debra) crossings, they tell you which direction to look so you don’t get run over looking the wrong way. Which reminds me – does anyone out there know why the UK decided to switch things up and have the drivers on the left side of the road instead of the right? Or why the rest of the world chose the other way? No one’s been able to tell me yet. I’m doing a load of laundry now (thanks Richard!) and resting up because man, its a bit of a switch from sitting at a desk all day to walking around for 8 hours a day. But I love it. Tomorrow we’ll take a boat into The City (or back home, depending on weather), visit The Tower and Greenwich (where I’ll be able to sync my watch to perfect Greenwich Mean Time) and hopefully get afternoon tea. I can’t believe I’ve been on holiday for almost a week now. It’s flown, but I’ve managed to fit so much into just over six days. Where do you think she’s headed? Wednesday was a crazy day, in terms of all that we did. Well, all that we walked, actually. I got a later than usual start, since Vanessa’s flight didn’t arrive until 11ish. I took the tube in and got back my bank card (huzzah! ), then went up to the hotel to meet her. It was very cute, on Sussex Garden, which is three long blocks that are basically mini hotels on either side. Ours was typical European – little rooms, little bathrooms, minimal amenities. But it served us quite well. After a quick bite, we hopped on the train and headed to Harrods! Wow, is that place insane. Its size reminds me a bit of the big Macy’s store in Herald Square, but it is so much gaudier. The food hall was beyond amazing – meats and cheeses and chocolates galore. We also took a peak at shoes we couldn’t afford (760 pounds for one pair!) and other dream items. That put us in a bit of a shopping mood, but first we thought we’d visit Westminster Abby. We were too late, so we continued on to visit The Ritz (I used to do PR for them in another life), then discovered Old Bond and New Bond streets, which are fabulous pedestrian shopping arcades. Found some choice items. We ended up in Soho (I don’t believe it stands for anything in the same way it does in NYC, but someone feel free to correct me on that), and had a very yummy, very leisurely dinner. Then we walked back down to Westminster via Trafalger Square so we could sneak a peak at No. 10 Downing, where Prime Minister Blair lives. Then we crossed the bridge so I could snap a photo of the Houses of Parliament at dusk, all lit up. Just gorgeous. Trained it back up to the hotel, and watched the last few minutes of Big Brother 8. It is a much bigger deal here than back in the states, and trust me, from what I saw it is hilarious. Um, where’s my debit card? First full day in London. Up at 6:30 so that I could get a proper shower before Richard had to get ready for work. It’s interesting – I had to turn the hot water heater on and wait 10 minutes for it to heat up first. I went into town with Richard then was left to my own devices. We both decided umbrellas were not necessary for the day. We both were wrong. Although it was just cloudy most of the day (it started out perfectly clear, hence the decision), there were some showers. Thank goodness for cafes. I stopped by the monument to the great fire of 1666, then walked on to St. Paul’s cathedral, where I hiked to the top. The very top. There is some discrepancy in the number of stairs I actually climbed – the church says 434, although I’m not sure to what level that is. Lonely Planet say 530. Either way, my legs felt it. I also think I’m about the cutoff height for comfort. I had to duck a lot, and there were some very skinny corridors, but someone like my 6’8″ father would not have enjoyed it. But it was so worth it – the view from the very, very top of the dome was just brilliant. After St. Paul’s I passed Old Bailey (the criminal courts, but I couldn’t go in because I had a cell phone, a bag, and a few other things that aren’t allowed in) and the Royal Courts of Justice. I stopped briefly in the Covent Garden Market, which is a bit touristy. Then I walked on to Trafalger Square, then popped into the National Gallery briefly (VERY briefly). I wandered over to Buckingham Palace, where I realized it was 11:45, and the changing of the guard was occurring. Although I didn’t see them march in (but did see what I believe to be the group of relieved guards marching out), I did hear and see the band playing behind the gates. When I was still a good ways off, I swore I was hearing things, as I thought it was the Phantom of the Opera being played. I was correct – a medley of the Phantom songs were indeed on the bill. A friend tells me they alternate among the military branch bands, but I’m not sure which was playing today. After that experience (I took some photos, mostly over heads as the crowds were quite large), I walked to Westminster Abby. The plan was to tour that, then take a look at Big Ben / Parliament. I opened my wallet to get out some money, and . . . my debit card was gone. I had stopped at a Citibank branch (there aren’t many, so I had my eye out) to get cash earlier in the morning. Unlike my bank in the states, the bank here takes one’s card and holds it for the duration of the transaction. I got my cash, got my receipt and was on my way. Needless to say I turned around right quickly and walked back to the bank – by the time I got there about 90 minutes had passed. Luckily, the machine kept the card – the folks at the bank heard the beeping and tried to find me but couldn’t. So at least the person after me didn’t take my card or anything. Unfortunately, they can only access the ATM twice a day, so they will retrieve my card in the morning Wednesday. But as I said to a friend, it could have been worse, no harm was caused, so no stress, no worries. After that fun, I caught the tube to Oxford street for some shopping – I hit Topshop, but the fashions were a bit not of my style, so I passed. I walked back to where I started the day, then looped nearly all the way back again looking for a shop I had passed in the morning selling something I wanted. It took a few tries to find it, but I was successful. Now I’m back at the flat, resting a bit before heading to meet Richard to get some noodles and see Pirates of the Caribbean. I always feel more like I’m really in a city when I do something normal, like grocery shop or see a movie. Tomorrow (after I retrieve my sad little bank card) I’m supposed to meet Vanessa, who is flying in from Dublin. Not sure what’s on our agenda, or how we’ll connect, but I’m confident we’ll find a way. Well, I’ve made it to London, and the fun continues. On Saturday the five of us (Allegra, John and her folks) had breakfast at the cottage then went to Burford (it’s really best pronounced with your teeth clenched and a Mr. Howell-from-Gilligan’s Island accent), which is one of the major villages in the Cotswolds. After that Allegra, John and I split off to go see Stonehenge! It’s wicked cool, although we didn’t pay the five pounds per person to go stand five feet closer; instead we took some great pictures over the fence. We also grabbed some English strawberries (yum!) from the side of the street while stuck in the holiday weekend traffic. I also tasted Chicken Curry Crisps (suitable for vegetarians – which, may I add, how fabulous would it be if they picked that up in the states? Being able to just look for the phrase instead of analyzing ingredients would be wonderful). After Stonehenge we headed over to Bath, home of the famous Roman Baths. We caught a bit of the local cricket match, then went for a late lunch. It was a very leisurely afternoon, to the point where we were in line for the Roman Baths at 16:55, and told they were closing, as the doors shut at 17:00 (sadly, none of the guide books mentioned that even though it closes at 18:00, last entry is 17:00). However, Allegra wasn’t having it, and she argued we had driven three hours, we were in the queue before 17:00, and damn it we were going to get in. So we three were the last to get in, and it was well worth it. The baths were very cool – a temple to Minerva (! ), and in the past you would write a curse down and throw it in. Now they let you throw in coins to make wishes. We made it back to the cottage in time for a very yummy home cooked meal (Allegra’s father is an amazing cook) of asparagus risotto. Sunday we were up reasonably early again, and headed out to Blenheim. We were treated to weather more typical for England in February, but that didn’t stop us. Blenheim is the home of the Duke of Marlborough, and also where Winston Churchill was born! The downstairs was pretty cool, but the upstairs had this beyond hilarious “secret story” about all of the dukes, featuring (I’m not kidding) anamatronic storytellers. It was hilarious. Unfortunately, we couldn’t tour the grounds because of the weather, but we just pushed ahead to Oxford, where most colleges were closed due to exams. It was pouring, we got soaked, but we had loads of fun. Today we tooled around the Cotswolds, visiting Lower and Upper Slaughter and a couple of others. 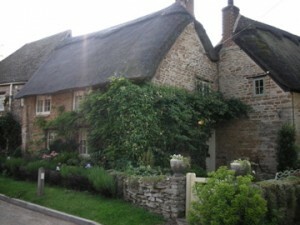 You will definitely be treated to lots of photos of traditional English cottages. I hopped a train to London, and Richard found me at Paddington without us even having to send blackberry messages back and forth. We came back to Canary Wharf (canarsees as he calls it), stopped for a pint (cider . . . yum! ), and now are back at his flat at the Isle of Dogs, about to have some dinner. Tomorrow I’m still not sure what I’m doing, but I’ll probably catch the train in to the banking district with Richard, and then wander from there. I hope you all enjoyed the holiday weekend. Is there a Duke of Marlboro lights? I’m here! I’m sitting outside of a pub in Kingham, Oxfordshire. I left New York last night around 10 PM and had an uneventful flight direct to Dublin. This morning I made it through to a connection to Heathrow, and then hopped on a bus to a park ‘n ride outside of Oxford, where Allegra’s dad picked me up. There were some follies trying to connect (my text message from my blackberry didn’t hit her dad’s cell phone, and Sprint doesn’t have service agreements out here), but he ended up arriving only about 10 minutes after I did. On the way to the cottage we drove past some charming villages, filled with all of these stone buildings that just scream English countryside. Then we arrived at the cottage. For real, it is straight out of a storybook. It has an actual thatched roof (I hear the fire insurance on those is a real pain). Inside, the ceiling is probably about 6’2″ at the highest point, so the bets are on as to who will hit themselves first going up or down the stairs. After I spent some time reading a bit and just unwinding, Allegra and John arrived from their day out having adventures, and we walked the five minutes down the lane to the pub, where we are now. I’ve only been here for a couple of hours, but I am in vacation mode. It’s relaxing, it’s calm, and frankly, even with what would usually be stressful travel (making connections, catching a bus, etc), I feel like “eh, it’ll work out.” I so hope that I can hold onto that frame of mind because DAMN, it’s awesome. Okay, a week from tonight, I hit the road, kids! And I can’t wait. Here’s the schedule so far . . . I cannot wait. I’ve finally started looking into what I want to do and see in London. I also found out my ATM/Debit card is set to expire in the middle of my trip, so I’m doing a bit of financial acrobatics to make sure the new one arrives on time. Long time no post! I participated in Play in a Day this weekend, and it was a trip.I was in a group of three actors, so there were fewer lines to learn. The play was about purgatory, and had some good writing. The direction, however, left a bit to be desired. The director really wanted something more abstract and Absurd (as opposed to just absurd). On Saturday I was excited to have nine friends and coworkers in the audience. In a theater that only seats 50, that was pretty freaking awesome. Saturday’s performance was okay, but Sunday’s was much better. Which makes sense. Now I am exhausted, but in that way that is invigorating, if that makes sense. I’d love to take a nap, but I also want to spend today working hard and doing well at work. I got to be creative over the weekend, and loved it, and now I can focus on being creative at the office in whatever ways possible. Only 17 days until I leave for my trip – I’ll be sure to post updates when I’m there, so stay tuned!